We arrived at Mittagong station by two o’clock in the afternoon. Made a call to the hotel who were already expecting us, and were picked up by friendly staff member Simone within five minutes of alighting from our train. After a slightly longer scenic drive back to the Inn, ‘It’s hard to cross the Highway if you take the most direct route.’ said Simone, we were soon looking at the long gravel drive and the beautiful Fitzroy Inn herself. What equally impressed Kent and I, was that Simone had two rooms ready for us to choose from, due to my request for ‘a room with plenty of natural light’. We were shown one room in the original building downstairs with direct access to the side verandah and gardens, then another upstairs at the front. 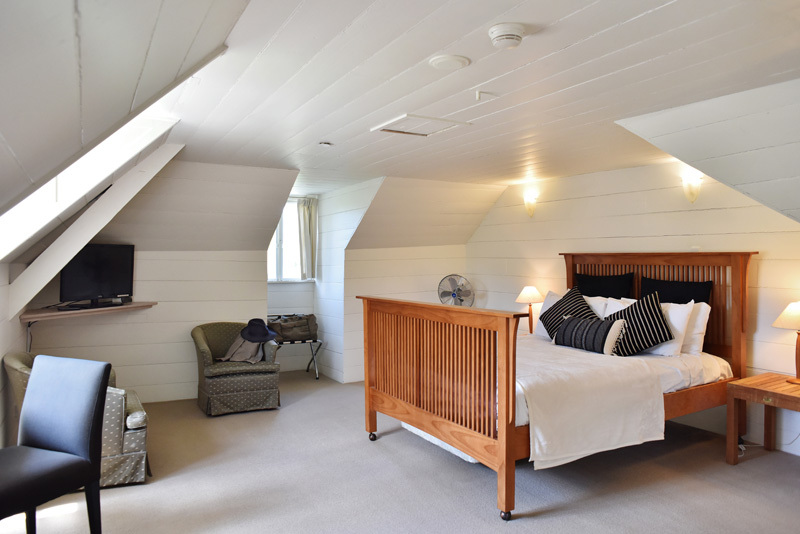 Well as we were shown the second room, we were charmed straight away by this spacious light filled loft room with it’s dormer windows and regency style lining boards. ‘Wow, great character!’ I thought, and so we took it. Check in was quick and easy in a laid back Australian country style manner, chatty and personable. When I was handed our key – a solid, metal one, Kent said, ‘A real key! Well that’s part of the period charm!’ And I think he was right! Our Historic Inn Superior Room at Fitzroy Inn. Room Five, that was ours and yes that is what to ask for, a Historic Inn Superior Room, this bright naturally lit room of simple elegance had become our temporary home in Mittagong. What I loved about this room, other than I have always been attracted to loft spaces, was the ability to overlook the beautiful manicured gardens from our windows and the central courtyard from the bathroom. And there’s a bath! You can always win me over with a bath! One thing I have to mention here, the day we arrived, it reached 30C in Mittagong which was pretty warm, and while it’s not an air conditioned room, we were happy to open the windows and use the fans provided. After all, we travelled all the way here for the country fresh air. 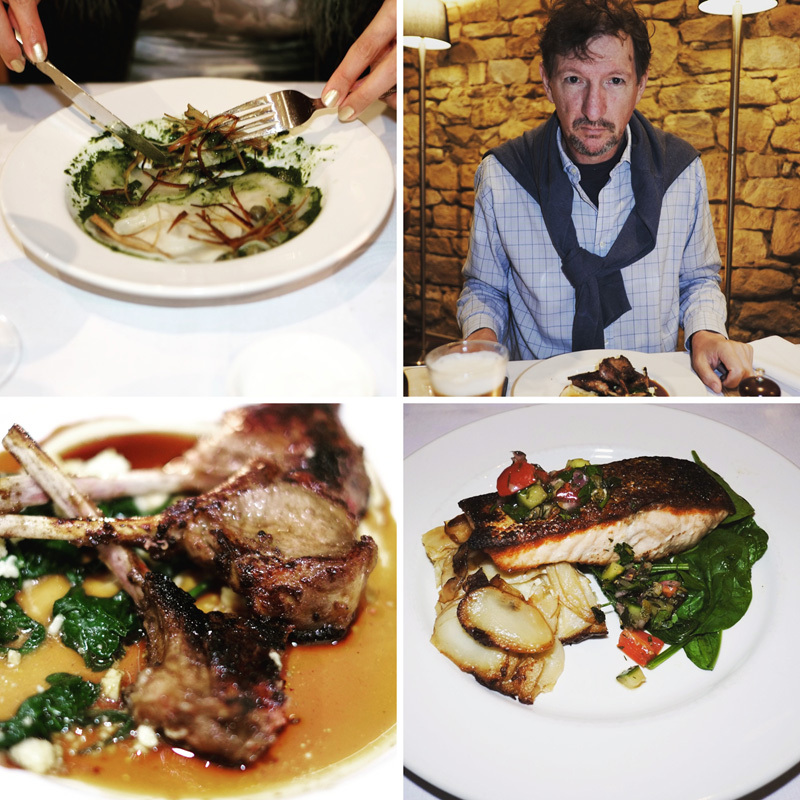 My pre-birthday dinner with Kent at Phatt Duck Dining, Fitzroy Inn. Knowing that the renowned Phatt Duck Dining at Fitzroy Inn is only available for functions and Saturday nights. I made sure to book a table for two that Saturday during our stay. It also happened to be my pre-birthday dinner. There were four tables booked that evening. We had a friendly waitress and the atmosphere was intimate. Kent skipped the entrée though I couldn’t resist the Ravioli stuffed with Scallop Mousse. Let me be honest with you, it was delicious! It was the star of my two-course meal that evening! My main dish was Atlantic Salmon with Spinach and Potatoes, well although my salmon was cooked perfectly, it was a bit lacking in sauce for my liking. On the other hand, Kent loved his Middle Eastern Lamb and I can happily say that overall, we enjoyed our dining experience here. 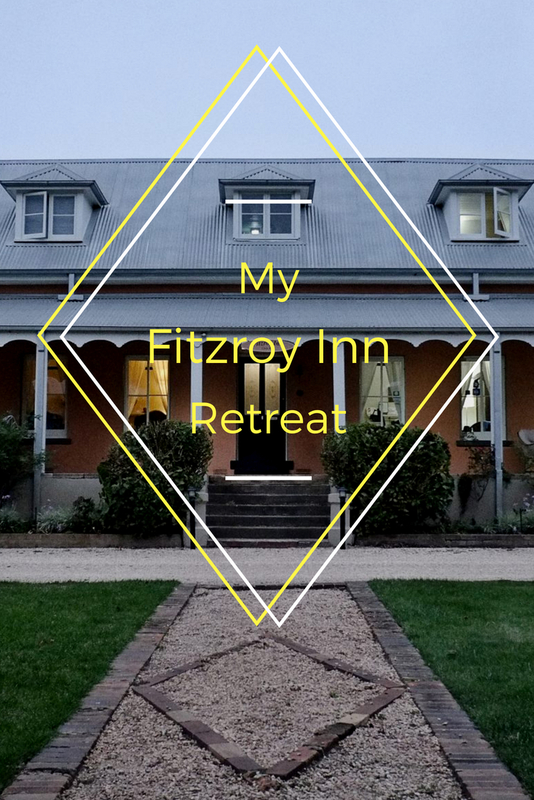 Read, relax and recharge at Fitzroy Inn, Mittagong. 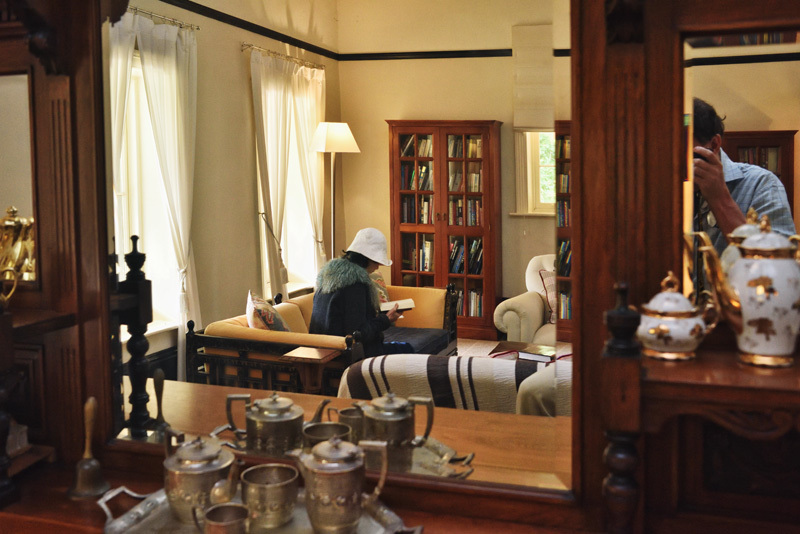 ‘Where shall I read?’ That was the question I asked myself every morning as we were spoiled for choice: the main lounge room, the library; the comfortable chairs on the verandah, outdoor chairs in the garden; chairs under the trees… You could easily pick a perfect spot to suit your reading mood, there’s somewhere perfect for everybody. And it’s lovely and quiet here. Living in the city, we are so used to all sorts of noises, the quietness of country living truly relaxes me. Staying at the Inn, the only sounds from outside besides the birds, was when a train occasionally travelled pass and cars drove by the wooden bridge; which, compares to the city noises we put up with daily, was pretty mild. During our stay, Kent and I often gushed about the fragrant pine scented country air, the ‘open sky’ and, on a clear night, the clouds of stars that make up the milky way, a whole galaxy worth as you can never see them in the city! Clockwise from top left: 1) A portrait of my beloved Holly. 2) Dining out in Vin Santo, Mittagong. 3) New additions to my fun jewellery box. 4) Enjoying my birthday lunch with friends at Your Vintage Occasion Tea Salon, Bowral. I had a furry happy birthday weekend indeed! Holding Holly, my beloved ginger Pomeranian in my arms again, was the most precious birthday gift I could ever asked for. Here’s the story, I had helped looking after Holly from time to time for an old friend since Holly was only two. And now approaching 12, Holly has aged and is not as active and full of energy as she used to be, so it’s our turn to travel and visit her in Mittagong where this gorgeous fluffy bundle of joy lives. On my actual birthday day, I did not mention it to our local friends and they took Kent and I out to the Your Vintage Occasion Tea Salon at Dirty Jane’s Emporium & Antique Market, Bowral. When we arrived at the Salon, there was a queue outside this vintage themed eatery; inside was very cosy, like stepping into an English tea room. The food? Although the cafe menu sounded casual, Kent and I were very impressed with how delicious and generous portions these ‘simple dishes’ were! We then realised that the queue outside did not happen by chance. 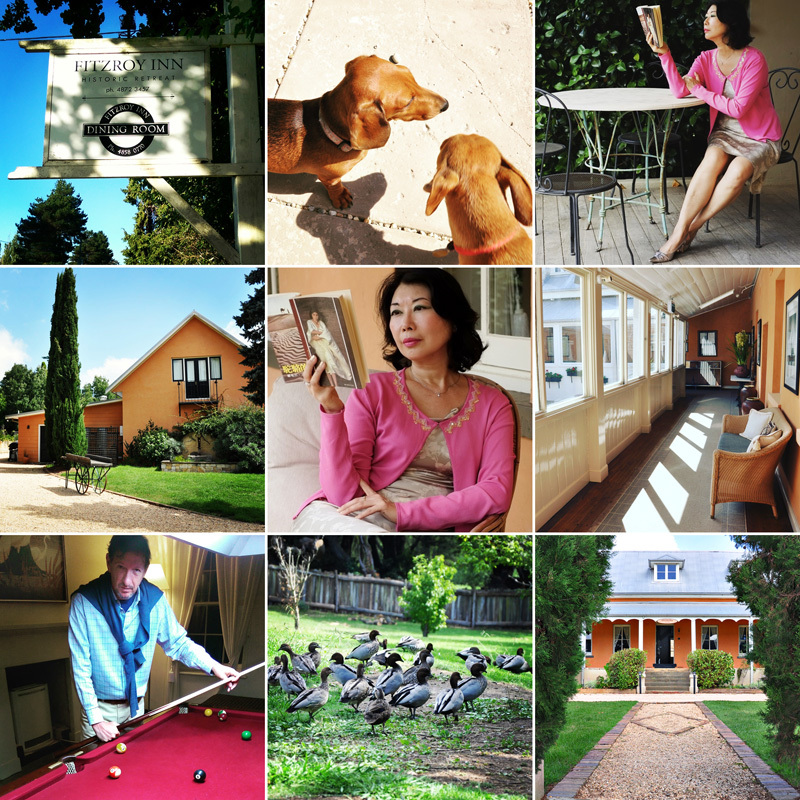 If you happen to visit Bowral, don’t miss it! Back in Mittagong, restaurants we tried and worth the mention were the Italian restaurant Vin Santo in the main street. Also a Vietnamese restaurant called Orange, only few doors down, which had an uncluttered contemporary feel and while not quite Cabramatta Sydney level, astonishingly authentic and so yummy that we revisited with a local friend. Very reasonable prices and generous servings too. Southern Highlands pretty much equals antique shopping so how could I resist a treasure hunt in the Mittagong Antique Centre? After a few visits, searching; hunting and digging which was all part of the fun, I found and bought two pairs of very bling-bling costume jewellery earrings. Aren’t they fun?! 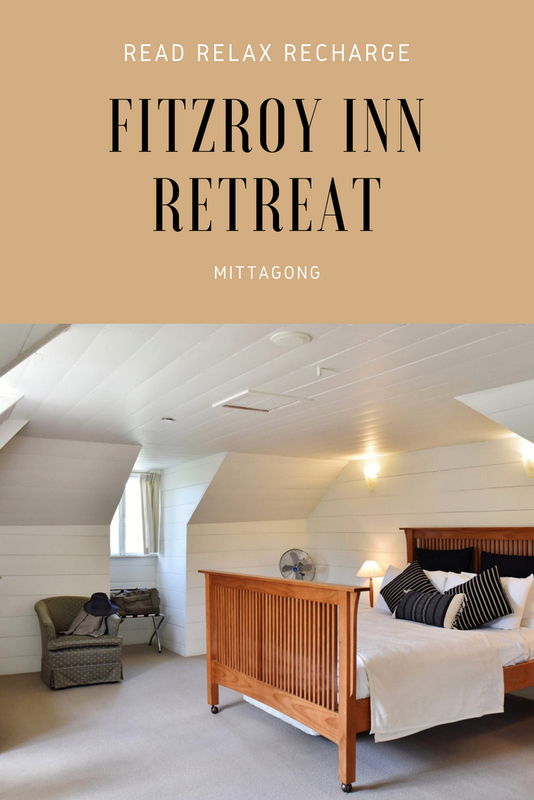 1) The Location: The Fitzroy Inn is tucked away just off the highway and five minutes walk to Mittagong Visitor Information Centre. 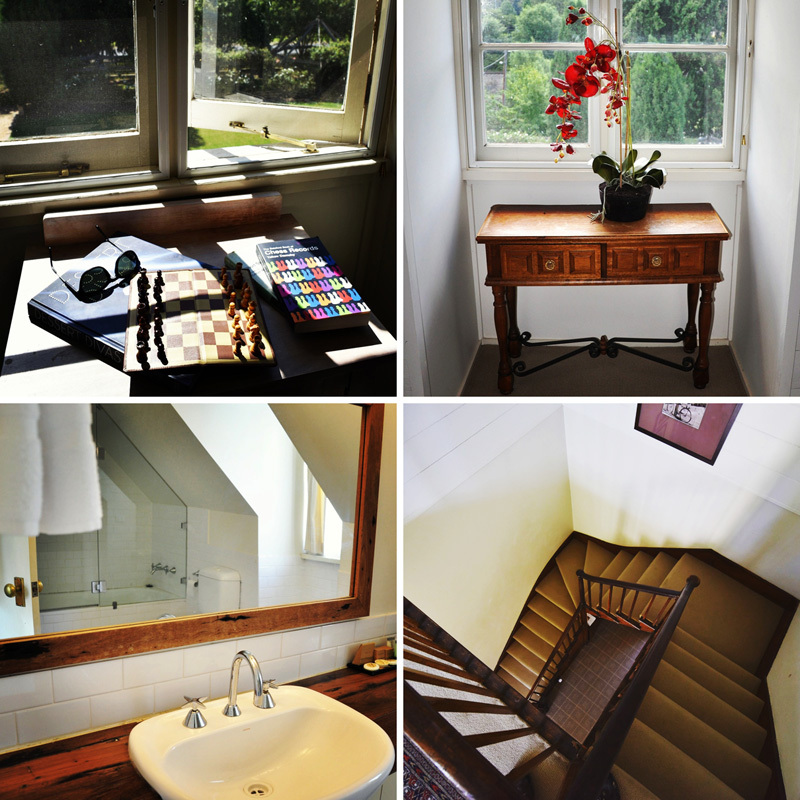 It takes a healthy 20 minutes walk to the centre of the town, restaurants, pubs; antique stores and the Mittagong train station. 2) Friendly Staff: We were picked up at the station when we arrived and were driven back to the station at the end of our stay. John Griffin, the owner of the Inn gave us a lift to the shopping centre when he heard that we needed some batteries one day. A little kindness like that goes a long way when it comes to customer service. 3) Readers’ Paradise: The library has a great cross-section of readable books to choose from according to Kent. 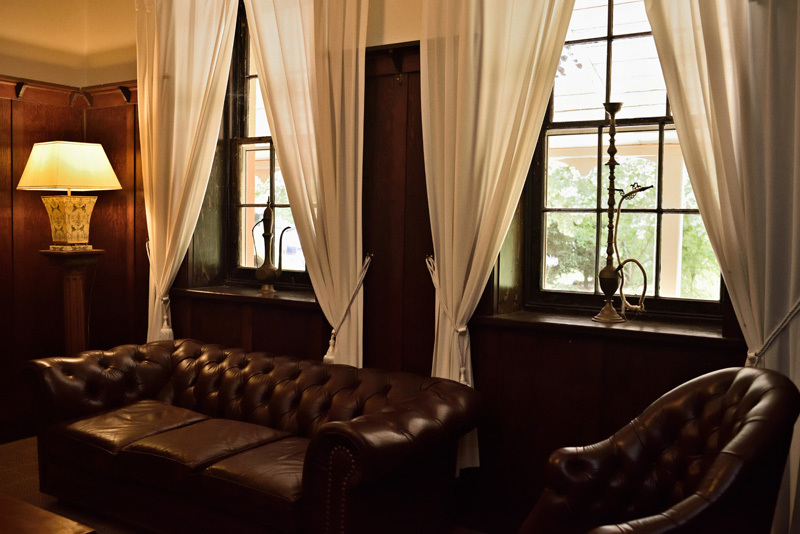 The Inn itself provides many great spots to read, indoor or outdoor? The choice is yours! 4) History Walk: Whether you prefer a self-guided tour or going with a group (minimum six people) it is worth the visit, especially so for those who’s interested in Australian history. Read my previous post to find out more details. 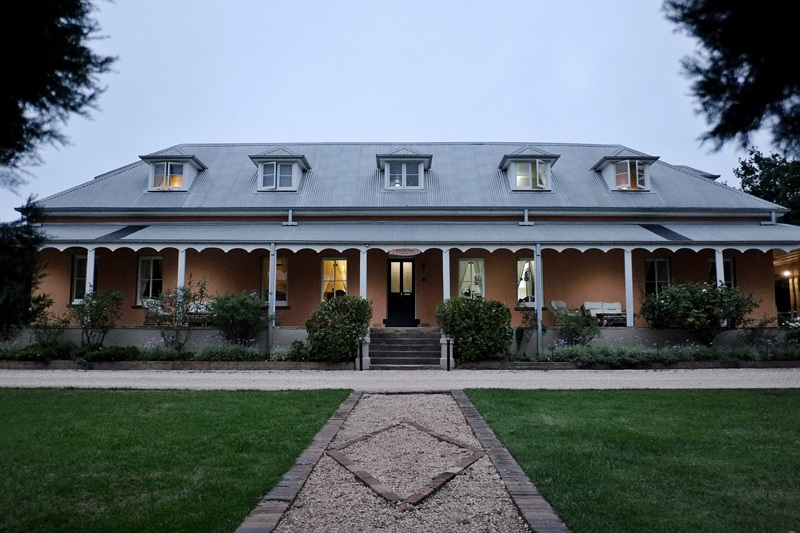 5) Australian Country House Experience: On our last day, I told John that my absolute highlight of staying at the Inn was to experience ‘the big house heritage living’! It is dangerously addictive but I highly recommend it! If you were a light sleeper, you might want to request a room down the back of the main building. Some of the rooms (like ours) which face the front gardens also face the railway and the wooden bridge. We didn’t mind it because we rather have the views. It was only our first night there I could hear the trains, ever since that night I had slept deeply without been disturbed. As for Kent, he slept well without hearing a thing throughout our stay. The solutions are, either using your own smart phone’s data, or take a few minutes walk to the nearby Mittagong Visitor Information Centre to use their Wi-Fi. We had passed our feedback to John and he informed us that real broadband was booked in for connection and would be on its way soon. Then again, it didn’t bother me the slightest as I tried to get away from the internet while on vacation. However, Kent works with his computer and a good internet connection is very important to him. Overall, to say that we had a great time is understatement. We’d love to comeback in a different season. 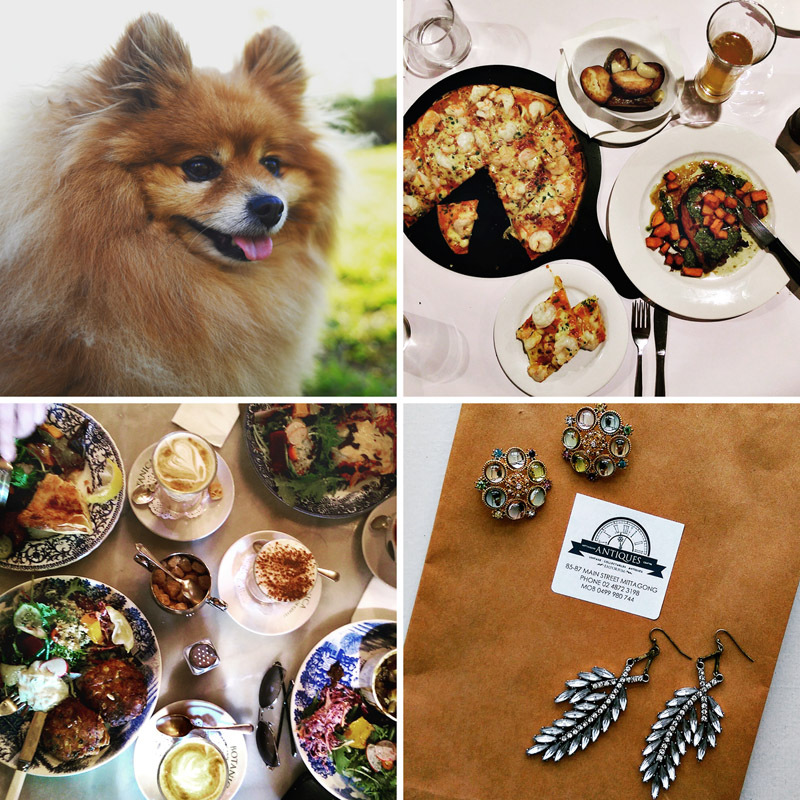 How did we travel to Mittagong this time? Since the total travel time would save us at least 40 minutes if we chose NSW TrainLink‘s Sydney to Canberra Line instead of Sydney Trains‘ Southern Highlands Line, so we went for it and our train tickets from the booking office in Central Station were the biggest tickets we had ever seen – in A4 sheets! We were happy with travelling by NSW TrainLink, not only did we save ourselves some precious travel time, there’s water for passengers and even hot meals ready for order (well, I have to try it next time).